Is Reloading 12 gauge Shotshells Worth It? This is a question that crosses my desk with regularity. In 2016, the best available version of the truth is “probably not.” Component pricing does vary, of course, as does the cost of the reloading presses themselves, so naturally you can plug in your own personal parameters. For many years, I've used a pair of MEC 9000G progressive presses in 12 and 20 gauge. 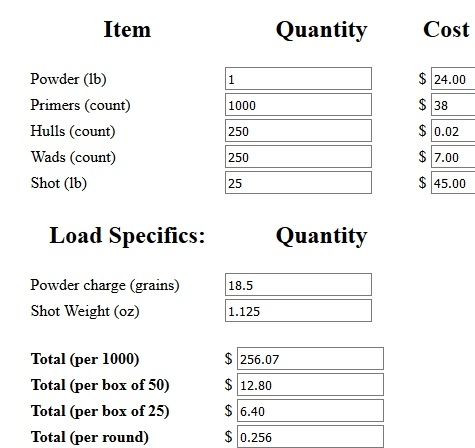 Assuming no waste, no spillage, no bad crimps, and no bench errors, and also assuming your time has no value at all, you are not paying haz-mat fees over and above the costs listed here, it is easy to spend $6.40 to load a box of 25 1-1/8 oz. target shotshells. Of course, our time does have value, and someone that wants to buy a new MEC 9000G today is going to spend around $600. Certainly, by using the cheapest propellants available, making lower payload shotshells, and calling hull cost essentially nothing (I'm using two cents per hull above) you can get the cost per box down a bit, but not all that much. Part of the culprit is the haz-mat and other fees, that have increased steadily. For 2015, the UPS haz-mat fee was $28.50, Adult Signature was $5.00, and the “Ground Residential Surcharge” was $3.10. For 2016, all of these fees have increased 4.8 – 5.3%. The ground haz-mat fee is now $30. We all know that nothing is free and that there is no such thing as “free shipping.” There is of course “shipping included,” but that hardly means at no cost. And, rightly or wrongly, 28 gauge and .410 bore ammo that uses less lead costs a lot more per box than the more popular 12 gauge loads. Additionally, there are countless sales, rebates, and so forth that can make commercial loads even more appealing. Driving is hardly free, either, for in 2016 even the IRS allows 54 cents per mile, down from 57.5 cents per mile in 2015. What it actually costs you depends on what specifically you are driving, insurance rates, and so it goes. So, while I'm sorry to be the bearer of bad news, in many cases reloading 1-1/8 oz. 12 gauge target loads makes no economic sense.